I admit it. I’m stretching with this one. I really have had such a hard time coming up with a good St. Patty’s recipe this year that isn’t packed with sugar. 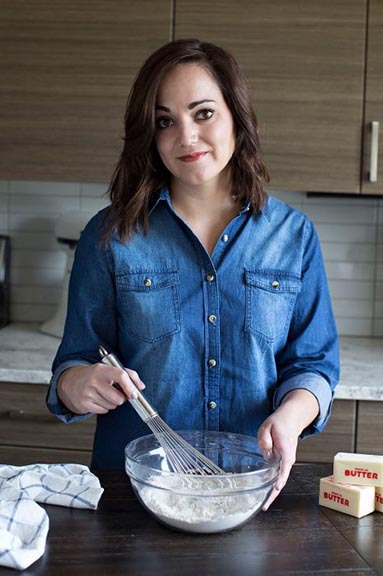 I felt like we needed something to break up the sweet and that’s how this recipe came to be. I have seen so many rainbow fruit trays all over Pinterest, but with just the three of us there wasn’t a huge need to create an entire tray. So I busted out our never used whiskey glasses and got to work. 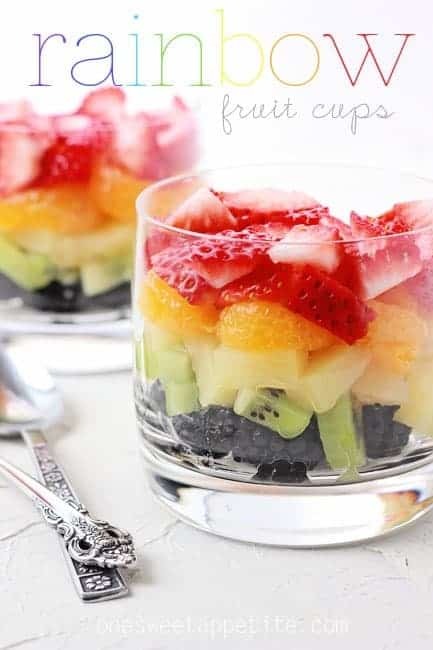 We were actually planning on having fruit salad with lunch one day and I decided it would be super cute to layer them for the kid. He went banana’s over it and gobbled up every bite. Even the blackberries! We did top with a little bit of cool whip. I know that’s like the devil or something (or so my mom says), but we love it so much more than whipped cream. Especially when you add it to a little fruit! It didn’t take too long to get these put together. I think the most time consuming part was slicing up the kiwi. 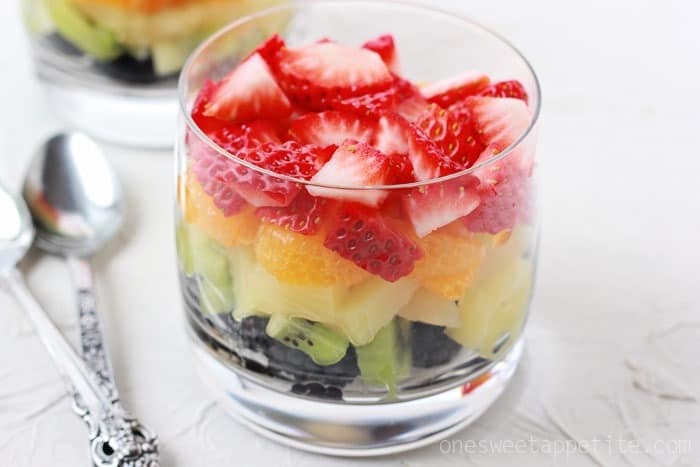 However, if the rainbow fruit cups aren’t really your thing, you can just toss all of the fruit into a big bowl and mix up to have a fun bright display of healthy goodness. I have a soft spot for a good fruit bowl. I didn’t add any additional ingredients but you can always sprinkle with a little sugar, add some lemon or lime juice and zest, or even a little mint. Layer your fruit inside cups and serve with whipped cream or cool whip. Another option is to toss in a large bowl. These are so fun!! Perfect for St Patrick’s Day! Love all the colors! 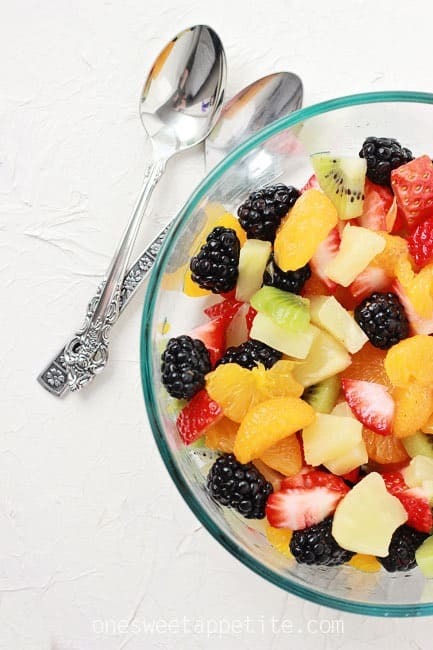 You can’t go wrong with fruit! Absolutely gorgeous photos! Love this post!! Pinning! I love rainbow fruit cups! It makes it so fun to eat fruit. Pinning! You aren’t stretching it at all, now I am craving fruit!